The School of Business offers programs leading to the Master of Business Administration (MBA) degree, the joint Master of Business Administration/Juris Doctor (JD/MBA) degree, and the joint Master of Business Administration/Master of Information Science (MBA/MIS) degree. The Master of Business Administration program is designed to prepare students for leadership positions in business, industry, and government by developing their understanding of complex strategies, tactics and their execution. While opportunities exist for specialization, program emphasis has been placed on breadth. Classes are structured to enrich analytical and decision-making skills through opportunities to practice problem definition, problem analysis, and problem solution creation. Students with any undergraduate major can be successful in the MBA curriculum; however, to properly prepare for MBA core classes students are required to possess or complete a group of foundation business courses. The graduate program in the School of Business is fully accredited by AACSB International - The Association to Advance Collegiate Schools of Business - AACSB International. Excellence - We commit to excellence in faculty and student interactions, other internal and external engagements, reputational enhancement and strategic resource management. The joint degree programs allow students to simultaneously pursue a degree in Law or a degree in Information Sciences while enrolled in the MBA program. Both joint degree programs allow students to earn two degrees in less time than it takes to earn them traditionally. The joint Master of Business Administration/Juris Doctor degree program can be completed in four calendar years. The degree of Juris Doctor (JD) is granted by the School of Law upon successful completion of a minimum of 88 semester hours of required and elective courses. The degree of Master of Business Administration (MBA) is granted by the School of Business upon completion of 33 semester hours of required and elective courses. Nine semester hours of graduate level business courses and law courses are reciprocal. Thus, the joint MBA/JD graduate will complete 24 hours of MBA courses. The joint Master of Business Administration/Master of Information Science degree program can be completed in two calendar years. The School of Business and the School of Library and Information Sciences grant Master of Business Administration (MBA) and Master of Information Sciences (MIS) degrees, respectively, upon completion of a minimum of 48 semester hours of required and elective courses. The joint MBA/MIS graduate will complete 24 hours of MBA courses. Students enrolled in the joint MBA/JD and MBA/MIS programs must complete the requirements of each program simultaneously in order to receive both degrees jointly and to take advantage of any reciprocal credits offered by the joint programs. If a student does not meet the joint degree requirements, the student will not receive the benefit of the reciprocal credits and will have to meet the separate degree program requirements. The GPA for the joint programs, however, must be met separately and cannot be combined because there is no joint degree GPA requirement. A cumulative grade-point-average of at least 3.0 in the MBA courses is required to complete the graduation requirements of the MBA portion of the joint degree program with no more than one grade of C. Any required foundation courses must be completed with a cumulative grade point average of at least 3.0. The School of Business restricts its graduate-level business administration and management courses to the University’s degree-seeking students. Students admitted to one of the University’s other graduate-level degree programs may enroll in School of Business graduate-level courses by permission of the Director of Graduate Programs. Special Graduate Students may register for MBA Foundation courses only. The course(s) was completed at a regionally accredited institution. The course(s) was restricted to graduate students. A minimum grade of “B” was received in the course. 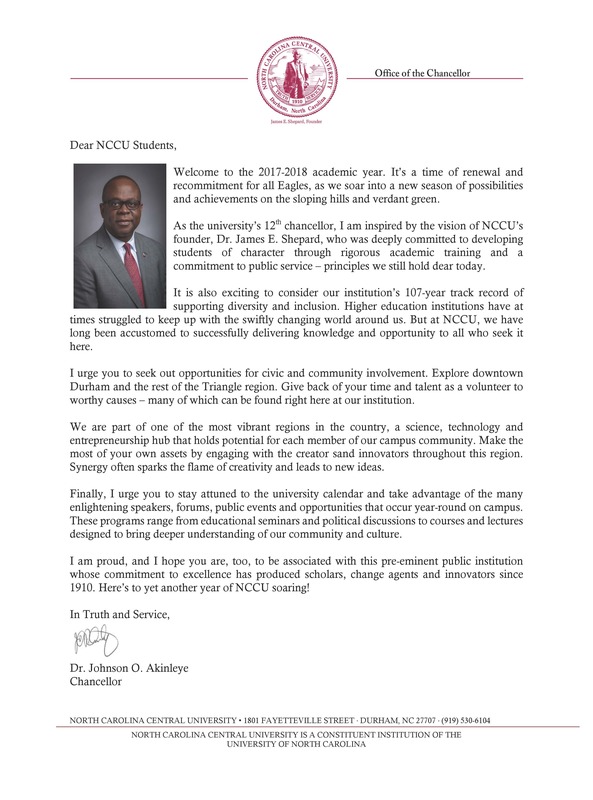 The content of the course corresponds to that of a course required or permitted in the program at North Carolina Central University. Once enrolled in the School of Business, a student may not pursue courses of any type at another institution for transfer credit toward a degree from the School of Business without approval from the Director of Graduate Programs. Following admission as a degree-seeking student in the graduate program, students are generally required to register each semester, exclusive of the summer sessions, until the degree is awarded. Students not maintaining their admitted status will be required to seek readmission and adhere to prevailing program requirements if readmission is granted.